Musbury Moles offers choice and flexibility when it comes to sessions and additional extras to help our parents and carers. Every morning we open at 8.00am and provide a healthy breakfast for our moles. We offer a certified Kellogg's breakfast club. Ensuring our children are ready for a fun day of learning. Breakfast club is open to Preschoolers as well as the school children. Costing £1 per 30 mins. School children will be taken into school for the start of the day.​ Our Preschool Leader has completed a level 4 course in conjunction with the University of Northumbria in delivering schools and community breakfast training. The Breakfast club is fully inclusive and offers a selection of toast and cereals from Tuesday to Fridays. 30 hours entitlement is offered up to 25 hours per week at Moles. Parents are asked to fill in details via the children's choices HMRC website (Please see link above) We require the PI code given to activate the additional hours. We work closely with childminders in the area to provide wrap around hours outside the Moles opening hours. Musbury Moles offers parents and carers choice when it comes to their child's childcare. Hourly rates which can be accessed across our Am and Pm sessions. Irregular hours can be accommodated via prior arrangement. Our am session runs from 8.00am -12.00pm and our Pm session 12.00pm - 3.00pm. We do require a minimum of 2 sessions (6 hours ) per week. All our children are fully integrated in sessions as we believe this is the best way of learning through social interaction and peer observation and interaction. We also share our secure outside space with the county primary school. Again this recent idea to coincide the groups has proven very well for the children's learning and development and school readiness. Our opening hours at Tuesday, Wednesday and Fridays 8.00-3.00pm and Thursday 8.00-1.00pm. We offer hot meal every sessions at £2.55 from outside caters Portlock Pantry. 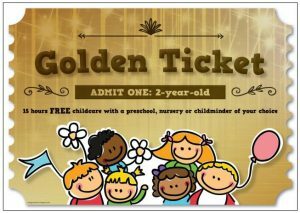 Golden Tickets: Free childcare for eligible 2-year-olds A Golden Ticket allows you to access free childcare for your 2-year-old, if eligible. This could be a place in a nursery, preschool or with a childminder. Squirrel group 2 years - 3 years. £4.25 per hour. Additional funding through Devon County Council two year old funding is available. Please click on link below to see if your eligible. £4.00 per hour/ Early years entitlement is for every child after the term of their 3rd birthday. Early Years pupil premium is also available. Forms regarding this will be sent with your child's funding or in application packs.